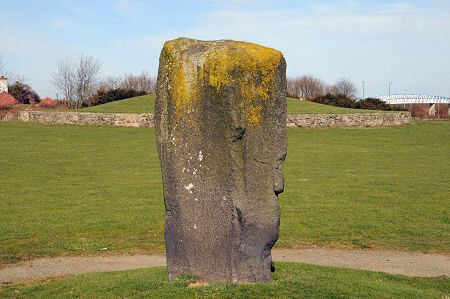 The Huly Hill Cairn and associated stone "circle" stands on the western side of Edinburgh some seven miles from the city centre. It would be difficult to imagine a less fitting setting for an ancient monument. The interchange at which the M8 and M9 motorways meet the A8 and A89 is immediately to the east of the site, and the motorway actually separates the main part of the monument from what may well be the largest of its stones, an outlier 320m to the east of the central cairn. 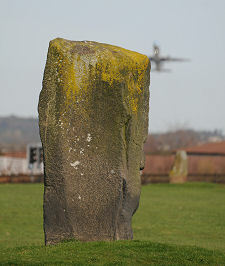 And if the overlay of modern roads and neighbouring residential and commercial development were not enough, the The Huly Hill Cairn stands just half a mile from the end of the main runway at Edinburgh Airport, and aligned with it, while the main railway lines west from the city pass just a third of a mile south of Huly Hill. Add in a location that carries nothing in the way of signage or interpretative boards and you begin to appreciate that this is a monument primarily for the enthusiastic collector of ancient sites. 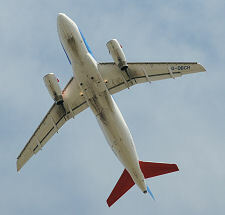 There are a few other things it is worth establishing up front. The first is that Huly Hill (or Heely Hill as it was originally known) is not actually a hill at all. The "hill" is a tumulus or a burial cairn which measures approximately 30m in diameter and rises to a height of 3m with, arguably, a slightly dished top. The cairn was excavated in 1830 and various items were removed, including a bronze spearhead and small fragments of animal bones. 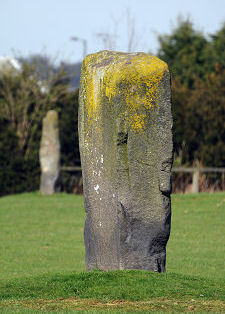 No trace was found of burial cists or urns, or of human remains. In modern times (though the sources are unclear about exactly when) the central cairn has been more clearly defined by the construction of a stone retaining wall around it. At about the same time as the retaining wall was built around the central cairn a circular path was built linking together the other features at Huly Hill, three standing stones which can be though of as standing on a circle 100m in diameter. If you do assume the three stones form a circle, then the cairn does not lie at its centre, instead being significantly offset to the north west. This might imply that the cairn and the stones were in use at different times and just happen to share a site: though the best date anyone can offer for either part of the monument is "around 2500BC". Another explanation offered in 1903 was that these three stones are all that remains of two separate concentric stone circles. There seems little evidence for this, though at least one author writing in 1852 claimed that the cairn was surrounded by 12 stones. By coincidence, 1852 also saw the publication of the probably more authoritative Ordnance Survey Name Book, which referred only to the three stones which can be seen today. 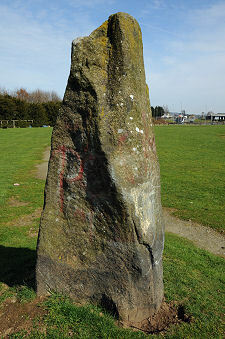 The three stones are named A, B and C. "A" is 53m east of the cairn and stands about 1.3m high, though appears to have been broken; "B" is 49m south west of the cairn and 2m high; and "C" is 31m north west of the cairn and 2m high. 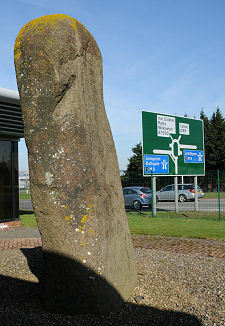 On an industrial estate 320m to the east of the cairn, and beyond the motorway, stands what is usually regarded as "Stone D", which is 3m high. Whether this really is an outlier of the monument or simply a separate standing stone is, like so much else about Huly Hill, open to debate. 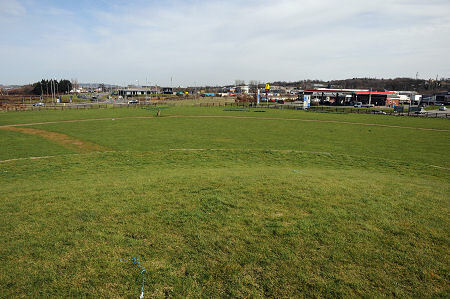 In March 2001 work was under way on the building of the industrial estate now visible a short distance to the south of Huly Hill when archeological remains began to be unearthed. A full excavation followed, which produced what is known as the Newbridge chariot. This had been buried intact as part of a human burial, some time around 250BC. This remarkably rare find suggests that Huly Hill and the surrounding area may have been used for burials for a period of over two millennia: or the choice of our Iron Age ancestors to undertake this burial within sight of the cairn and standing stones may simply have been a coincidence.